For the last ten years, Agnes Parsons’s biggest challenge has been juggling yoga classes and lunch dates. Her Santa Monica house staff takes care of everything, leaving Agnes to focus on her trophy-wife responsibilities: look perfect, adore her ol A refreshingly honest, laugh-out-loud novel about losing the life you always wanted…and finding the life you were meant to have. Thank you to NetGalley and Lake Union Publishing for the ARC provided in return for an honest review. I enjoyed this book more than I thought I would because it had more depth than I realized. Reading the descroptoin I thought it would be a light and fluffy chick lit sort of book. It was so much more. A middle school teacher in hiding sent to spy on the headmistress for her husband. Agnes grew on me as the story unfolded, ex cept for some parts where,she seemed a bit too eager when she got called to meet someone. Now if it was me, I would have been too anry to go. After being in her new position, I wouldnt just jump at the chance to be at someone's beck and call. nope. She grew as a person and a mother, and became likeable. I chuckled each time I read "the figg". I enjoyed this book enough to read it in 2 sittings and would recommend it to anyone wanting a deeper chick lit sort of read"
My thanks to NetGalley and the publisher for letting me read the free ebook in exchange for an honest review. When I try to think of how to write a review for this book, the first thing that comes to mind is, "Oh, it was cute." That's about how I would sum up this story. As I was reading it, it gave me a lot of warm feelings, a little bit of rage, and a handful of laughs. I didn't hate my reading experience, but I also am not going to be forcing this one into anyone's hands to try to get them to read it. As a mom, I really enjoyed the parts of the story where Agnes, the main character, struggled with mot When I try to think of how to write a review for this book, the first thing that comes to mind is, "Oh, it was cute." That's about how I would sum up this story. As I was reading it, it gave me a lot of warm feelings, a little bit of rage, and a handful of laughs. I didn't hate my reading experience, but I also am not going to be forcing this one into anyone's hands to try to get them to read it. As a mom, I really enjoyed the parts of the story where Agnes, the main character, struggled with motherhood, but alas, those parts were few and far in between. Agnes spent most of the book living as a single mom, but the story focused more on her job and her endless pursuit of getting her husband back. The frustrating part of this narrative was that every single character in the book could see how bad her husband was except for Agnes herself, and I just wanted to reach into the book and shake her - WAKE UP WOMAN, YOU ARE NO MORE TO HIM THAN A HOT BOD AND A BABY MAMA! Instead of investing in her daughter and loving watching her grow up, she sits around agonizing about the man who left her alone after one too many shady business deals. And even though I wasn't a big fan of Agnes, I like any book thatch evoke any emotion in me, even if it is slight rage. I had such fun reading Trophy Life. Lea's writing is warm and witty, like talking with an old friend, which is something you'll find in this story too. Readers will laugh and relate to Aggie Parsons from LA to NY, as she journeys on a path that returns her to her authentic self. I kept guessing and wondering what was really going on with her disappearing husband, who is, by the way, a total fork. He takes her for granted, assumes she's do whatever he wants her to, and likes their relationship wi I had such fun reading Trophy Life. Lea's writing is warm and witty, like talking with an old friend, which is something you'll find in this story too. I rooted for Aggie and cheered her on as she dug deep, examining her integrity and morals and what she truly wanted in life. I have a giant soft spot for boys like the middle school boys Aggie teaches. Distractible, prone to being in trouble, and disregarded, judged, and minimized by school professionals (except Aggie), my heart cried for these boys. I loved being a part of helping them alongside Aggie. 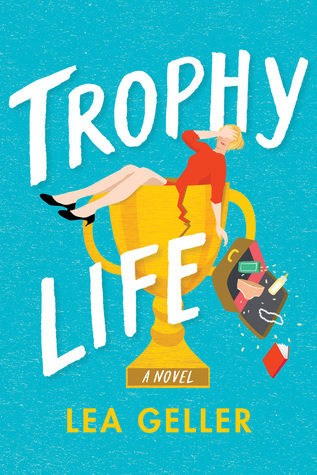 From trophy wife to Trophy Life, you'll chuckle, relate, and nod your way through this highly readable debut.